On September 13, I attended the Working Group on Distance Learning in Legal Education fall meeting that was held in the North Carolina Central University Law School. Although the conference was small, it was highly informative. I learned a great deal about the current state of technology, regulations, pedagogy, and best practices for distance learning for law schools. Attendees included faculty, administrators, vendors, technologists, and librarians. The Working Group on Distance Learning in Legal Education is “a loosely structured alliance of law educators collaborating to provide increased opportunities for faculty, students and other participants to access high quality, innovative, and interactive online legal education.” You can learn more about the group on their website which includes useful resources such as information about best practices, information the upcoming meetings, and model distance-learning policies. The working group holds meetings three times a year: in the fall, in the spring, and at AALS. The fall and spring meetings have been held at different law schools, allowing those law schools to showcase their distance learning programs. NCCU is a technologically innovative law school. One of their showpieces is an impressive teleconferencing room. The room allows participants in seminars held on different campuses to interact with each other as if all of the students were in the same place. NCCU’s clinic also uses advanced teleconferencing technologies. They have a sophisticated set-up that allows students and lawyers to connect to clients from across the state. 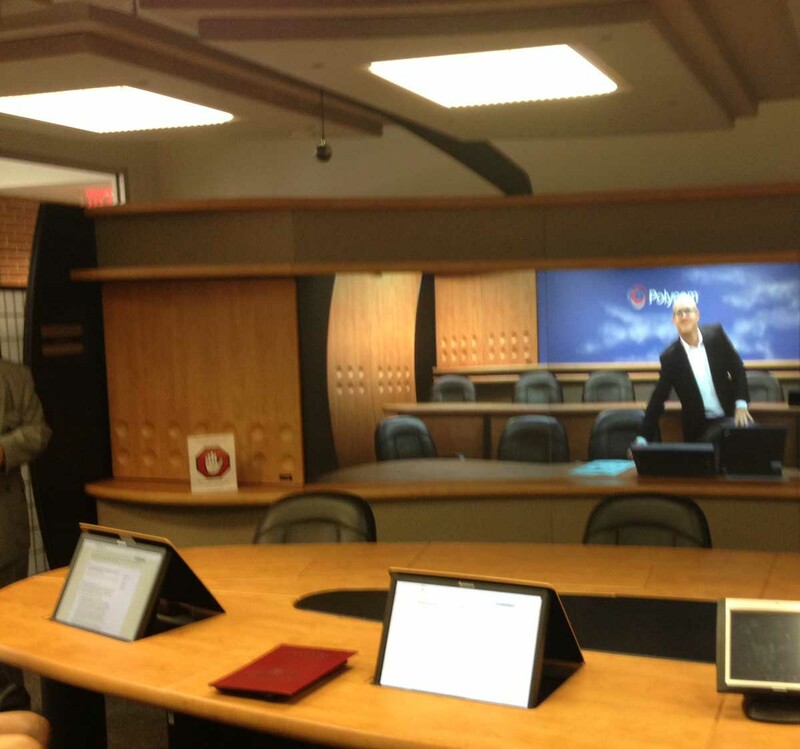 This room can handle up to 16 video inputs at the same time, so it can also be used for distance-learning classes. Regulations affecting law school distance education programs can be complicated. For example, a law school may be located in one state, but students may be located in other states. All of these states’ regulations may apply. The out-of-state regulations may be complicated, expensive, or even contradictory. Of course, this issue can be more tricky if the students are international. Choosing technology for distance ed programs can be particularly challenging. Schools need to select technology that offers the features faculty need to effectively teach. But the technology must also be accessible to students – students whose technology set ups are completely unpredictable. Some students may prefer to access their courses on new iPads using high-bandwidth broadband, while other students need to use old computers and dial up. It can be a struggle to offer students were not physically on campus services that are similar to residential students. For example, how can law schools provide IDs to distance learning students? It can be almost impossible to verify whether nonresidential students are the people that they say they are. But without the IDs, the students may be denied essential services. Without solid netiquette policies, students may behave distracting ways when participating distance education courses, particularly synchronous courses. We discussed how to discourage students from distracting behaviors like eating, talking to children, or dealing with pets while participating in class. Faculty also need to be taught how to present themselves online. Faculty may not realize that their physical background affects how they appear on camera. For example some faculty present synchronous lectures in front of a bright window –which means students can’t see them. The question of who owns material from distance-learning courses has broad implications. There are the standard questions about posting materials created by third parties to web sites, of course. However, there are also questions about who owns the distance learning course material itself. Adjunct faculty may wish to create a distance learning course that can be used at several different law schools, for example, while the individual schools may feel that they own the course material. One of the best parts of this meeting is that it focused on deliverables. For example, during the meeting, we reviewed a start-up checklist for law schools considering distance ed programs. Shortly after the meeting, the attendees received a revised checklist based on our input. Look for the next meeting at the upcoming AALS conference in January.